Trump promised autoworkers like Dnitra Landon that he would save manufacturing jobs in Michigan. Instead, he gave corporations like General Motors massive tax cuts. When those same companies ripped jobs from American workers, Trump did nothing but rant on Twitter—blaming everyone but himself for losing the jobs he promised to save. This is the cost of Trump’s false promises: Corporations rake in billions while American workers pay the price. Two weeks ago, thousands of workers lost their jobs when GM closed its Lordstown, Ohio plant. 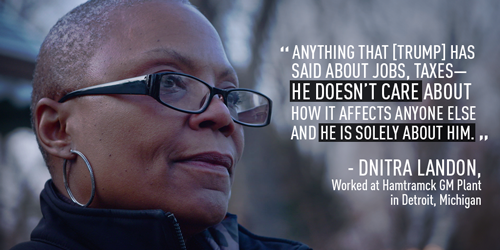 In just a few months, thousands more workers will face the same fate in Detroit. Rather than accepting responsibility for his own lies, Trump took the cowardly route of attacking the union leader for the Lordstown area, David Green, on Twitter (after seeing Green’s appearance on Fox News, of course). Share Dnitra’s story on Facebook and Twitter to spread the message: Trump’s false promises have real, devastating consequences.